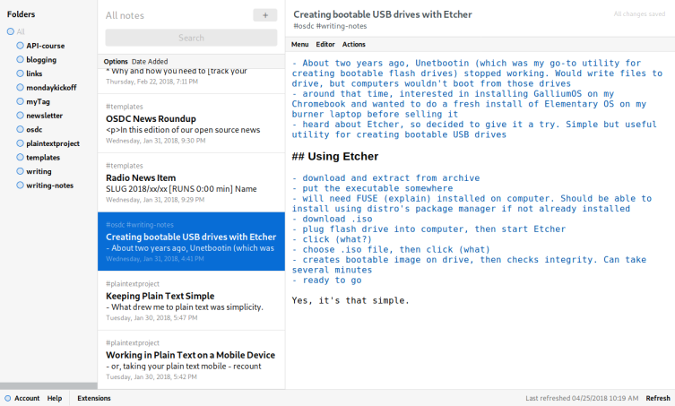 Keep track of your notes with this simple, open source alternative to Evernote. Online note-taking tools seem to have bloomed like 100 flowers. The tallest ones in that garden are usually proprietary, closed source applications like Evernote, Zoho Notebook, Google Keep, and Notion. There are a number of simpler, open source alternatives to proprietary note-taking applications. One of the newer ones on the block is Standard Notes. Standard Notes was brought to my attention a while back by its developer, Mo Bitar. I've been using Standard Notes for almost a year, and it does a great job of organizing my information. Standard Notes is open source. That means if you have the technical know-how, you can grab the building blocks of the application and modify them. Or you can just install it on your own server. That might work for you, but I'm not an uber techie. Or a techie of any stripe. So, I took the easy route and registered for the hosted version of Standard Notes. It's free, although you can get a paid account that gives you access to a number of extensions that beef up Standard Notes. The interface is plain, but it is functional. Click the + icon in the All notes pane to create a new note. Give your note a title, (optionally) add a tag to the note (more on this in a moment), and start typing. Simple, no? Out of the box, Standard Notes is plaintext-only. No images, no formatting, no tables, nor anything like that. You can add markup to your notes (using, say, Markdown or HTML), but you don't get syntax highlighting or a preview. Unlike Evernote and some other note-taking tools, out of the box Standard Notes doesn't have a way to organize notes in folders. Your notes are in a long (assuming you have a lot of notes) list in the All notes pane. Instead, you can use tags to organize your notes. You can add tags to a note by typing in the field below the note's title. When you want to filter your notes, click the tag in the Tags pane. Only the notes with that tag will appear in the All notes pane. You might be coming to Standard Notes from Evernote. Or, you might have plaintext notes scattered across various devices. How do you get them into the app? Use the import conversion tool, which converts Evernote or plaintext files to a plaintext data format called JSON. Once you've converted your notes, import them by selecting Account > Import from backup. The import tool has a couple of limitations. You can only import one file at a time. That can be cumbersome if you have a large number of notes. If you're moving to Standard Notes from Evernote, you'll lose formatting, images, and attachments. Decrypted, which converts all your notes to text files and compresses them into a ZIP file. While it has little to do with taking notes, one of Standard Notes' selling points is privacy and security. The application says it is "100% private. Your notes are encrypted and secured so only you can decrypt them. No one but you can read your notes (not even us)." Standard Notes is simple and it's flexible. That it embraces the plaintext ethos and is open source are the two main reasons I started using it and continue to use it. Several paragraphs back, I mentioned that you get a lot more with a paid account—these include themes, editors that render markup, desktop extensions, and options to create folders, as you can below. It's up to you to decide whether those features are important to you, but subscribing helps keep the service afloat and development chugging along. Standard Notes gives me both the simplicity and flexibility of Simplenote and Laverna (another favorite notetaking tool)—so much so that I've moved my notes in Laverna over to Standard Notes. As an online note-taking tool for the plaintext junkie, you can't do much better than Standard Notes. This article was originally published, in a slightly different format, at The Plain Text Project and appears here via a Creative Commons Attribution 4.0 International License. I'm also a subscriber since summer this year. Replaced other note taking applications completely for me.